With an over 5-decade career of film and television acting behind him, Russ Tamblyn can rightly be described as an icon. He marked his screen debut back in 1948 and has since garnered a countless number of movie credits including an Oscar-nominated performance in the 1957 drama film Peyton Place. Interestingly, Tamblyn was very skilled in gymnastics and acrobatics in his youth and consequently, he worked as a choreographer in the 1980s. The talented actor had his most notable television role in the 1990s horror series Twin Peaks starring as Dr. Lawrence Jacoby. He also reprised the same role in the 2017 revival of the show. This iconic actor was born Russell Irving Tamblyn on the 30th day of December 1934 in Los Angeles, California. His mother Sally Aileen (Triplett) and his father Eddie Tamblyn were both actors. He was raised alongside one sibling, a younger brother named Larry Tamblyn. As a child, Russ Tamblyn was hyperactive and always eager to entertain. He trained as a gymnast and was also passionate about other performing arts. During his early teenage years, Tamblyn created a musical act which encompassed singing, dancing, juggling as well as comedy. He also began his acting career on stage, through which he caught the attention of Hollywood actor Lloyd Bridges. He marked his screen debut as an uncredited extra in the film The Boy With Green Hair (1948). He later got a much bigger role in the film The Kid from Cleveland (1949) which effectively launched his career in Hollywood. Interestingly, Russ Tamblyn was credited as “Rusty Tamblyn” in some of his earlier film roles. Since he marked his big screen debut in 1948, Russ Tamblyn has amassed several notable film credits including in Samson and Delilah (1949), Father of the Bride (1950), Father’s Little Dividend (1951), Seven Brides for Seven Brothers (1954), Peyton Place (1957), High School Confidential (1958), Tom Thumb (1958), West Side Story (1961), Son of a Gunfighter (1965), The Female Bunch (1969) and Django Unchained (2012). For his performance in the box office hit film Peyton Place, he was nominated for the Academy Award for Best Supporting Actor. In addition to his starring role in the 1982 comedy film Neil Young: Human Highway, he also served as a writer and choreographer. Tamblyn equally garnered notable television credits even as his movie career continued to soar. The talented actor was on the cast of the horror drama series Twin Peaks (1990-91) in which he portrayed the character Dr. Lawrence Jacoby. He equally reprised the role in the 2017 revival of the series tagged Twin Peaks: The Return. Russ Tamblyn was also on the cast of the comedy series The Increasingly Poor Decisions of Todd Margaret (2010-12) in which he portrayed a recurring character, Chuck Margaret. To further broaden his portfolio, Russ Tamblyn featured in telefilms like Running Mates (1992) and Inherit the Wind (1999) and he also recorded notable guest roles in the TV series General Hospital (2000), Joan of Arcadia (2004) and The Haunting of Hill House (2018). Through sheer hard work and consistency, Russ Tamblyn has managed to keep his showbiz career going for over 50 years. His net worth is pegged at a conservative estimate of $3 million. Now in his 80s, this iconic Hollywood actor has remained quite active in his career. He has recorded some remarkable film and TV roles after undergoing an open heart surgery in 2014. Russ Tamblyn has been married for many decades to singer-songwriter Bonnie Murray Tamblyn. The duo tied the knot back in 1981 and have remained inseparable ever since. They have one child together, a daughter named Amber Tamblyn who was born in May 1983. Tamblyn was married twice prior to his present union. His first marriage was to film and TV actress Venetia Stevenson and it lasted for just one year. His second marital union was with Elizabeth Kempton with whom he had one child, a daughter named China. 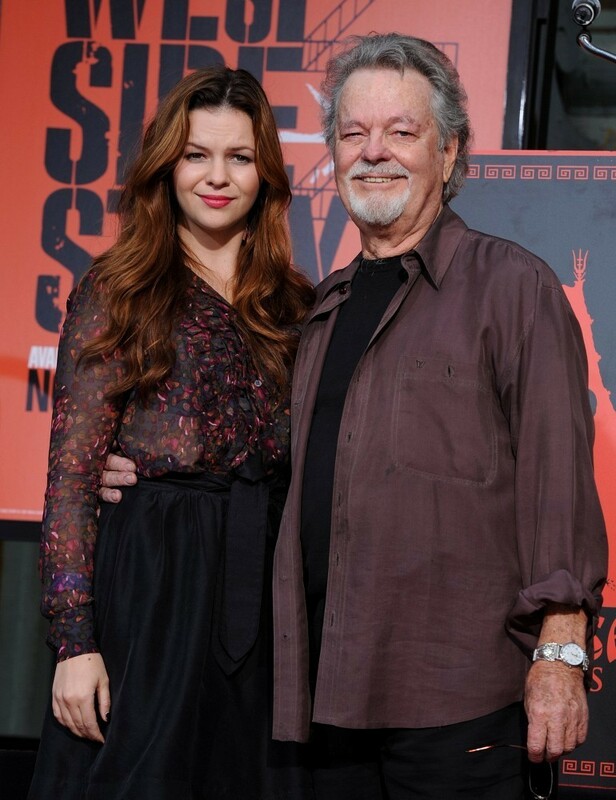 Apparently, Russ Tamblyn’s second daughter Amber Tamblyn has opted for a career path similar to that of her famous dad. In addition to being an actress, she is also a writer, producer, and director. She had her breakout performance as Emily Quartermaine on the ABC soap opera General Hospital (1995-2001). Amber Tamblyn later portrayed the titular character on the fantasy series Joan of Arcadia (2003-05) for which she received a Primetime Emmy and Golden Globe nominations. Beyond her flourishing Hollywood career, she has also authored several collections of poems and novels.